Whether you want to get your business up and running with one of the standard plans or you’re considering the Plus version, Shopify is a great platform for building an online retail business and they currently support over 500,000 sites. Shopify Plus estimates it handles around 6,000 checkouts per minute and is used by some major companies, such as Kylie Cosmetics and Nine West. However, it can be daunting deciding which plan is the right fit for you, so we’re here to shed some light on the difference between Shopify and Shopify Plus - so that you can find the best plan for your business. There are four different shopify packages you can choose from. The first three are the ‘standard’ Shopify plans and these are called; Shopify Basic, Shopify and Advanced Shopify. 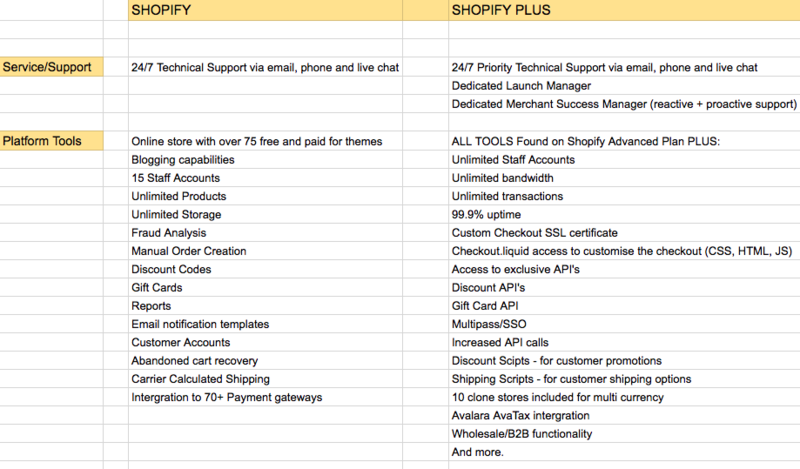 The fourth plan option is Shopify Plus. The ways you can easily determine which plan might be best for you is to evaluate which stage your business is at, what you may be able to afford and most importantly, what features and functionality you require. Each plan comes with its own price tag. Starting from just $29 a month for Basic Shopify. 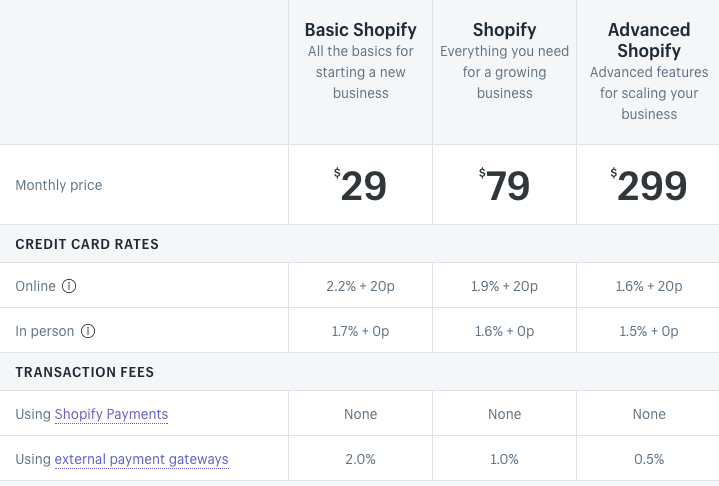 Shopify will cost you $79 a month and Advanced Shopify will cost you $299. With Shopify Plus, there are custom fees for each client that depend on the service you require but charges start at $2,000 per month. Essentially, you pay for what you get and the better the plan, the more benefits you will receive. The stand out difference between Shopify and Shopify Plus comes from its features. Unsurprisingly, you get a higher level of tools and features with Shopify Plus and this also comes with the chance to scale your business quicker. If your company has grown to something of a success, you want to make sure this continue to its best potential. There are some excellent features included in Shopify Plus such as customisable checkout pages and payment processing. Though standard Shopify allows you to build and customise how you want your storefront to look like, Shopify Plus goes that one bit further because it allows you to customise pages that the standard plan doesn’t allow. For instance, the checkout page. The Plus plan also gives you more staff accounts for larger businesses, which is great if you have 15 or more members of staff. And adding any new products in is so simple because you have to none of the backend code work as this is done for you. Additionally, there are over 1000 professionally built apps for you to use on your website. There is also a great feature that is especially useful if you are in the process of expanding or shipping worldwide, known as ‘clone store’. This allows you to create up to 10 multiple versions of your website under one account and it supports multiple currencies and languages. It’s also good to be aware of the support you’ll get post-launch. Though both Shopify and Shopify Plus have highly trained staff ready to help, Shopify Plus provides you with commited account managers. Furthermore, you get 24/7 priority support for any queries or issues. Plus will allow you to grow your business faster with more scalability. You get improved infrastructure through hosting, servers and CDN’s to deal with higher volume in sales and to deal with spikes from marketing, for instance if you have a Television campaign running. The Wholesale channel allows you to grow your business into wholesale by creating a separate storefront that is an extension of your online store. You can then track all your wholesale customers and orders under your current store's Shopify admin. You cannot sell wholesale via standard Shopify. You can also use Shopify Plus to sell your products directly on social media and online marketplaces, such as Facebook, Instagram, Pinterest, ebay, Amazon and many more platforms. You can use Shopify to sell on more than one sales channel, attracting a variety of audiences. By connecting each sales channel to Shopify, you can keep track of your products, orders, and customers all in one place. Shopify Plus has released an exclusive functionality called Launchpad. Launchpad helps plan and automate all of the activities necessary to execute a flash sale, product launch, or sales campaign on your website, so you don’t have to. Connect to third-party systems such as Netsuite, Microsoft Navision, Salesforce and more. Unrestricted access to Shopify API and better performance on Plus API. It’s also good to note that standard Shopify API limits you to 2 API calls per second whereas Plus API does not have this limitation. Plus gives you access to build and share custom reports and analytics with your team. You can prioritise and focus on the key eCommerce metrics that matter to you most. SDK’s (software development Kits) means you can build custom applications and solutions easily with Shopify Plus, such as in-store kiosks to mobile apps and more. You need to begin by evaluating which stage your retail business is at. Are you still fairly modest or an enterprise? The functionalities you require depends on the plan as the higher the plan you choose, the more powerful the tools you will have access to. Shopify is geared towards the small and medium businesses whereas Shopify Plus is for high volume merchants, and large businesses. For instance, if you’re a new retailer, one of the standard Shopify plans would be a great way to get started. Then, as you build momentum you can always upgrade to Plus to scale and grow. But if you’re a professional or experienced retailer with high volumes, Shopify Plus would be the best option, with all its extra features and support allowing you to manage your store to its highest potential while also saving you precious time.